Grenadine is probably the second home bar syrup you’ll get, right after you make some simple syrup. Wikipedia says that Grenadine is “a commonly used bar syrup, characterized by a flavor that is both tart and sweet, and a deep red color…..Grenadine was originally prepared from pomegranate juice, sugar, and water.” As you can see, this can cause some confusion: does grenadine contain pomegranate? Not always. In fact, many popular brands have no pomegranate at all. 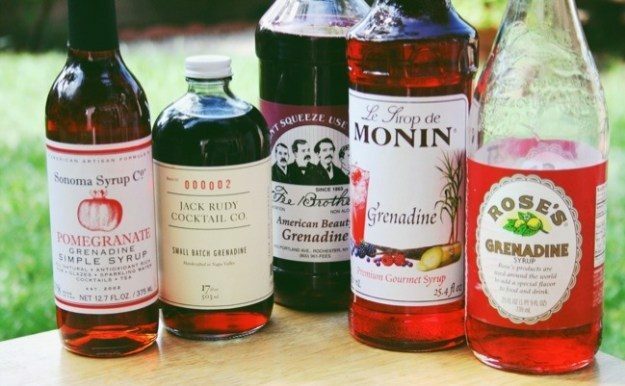 Here’s a bottle-by-bottle comparison of several popular grenadine brands, including some of the newer craft varieties. They’re pictured here from left to right. A bottle-by-bottle comparison of several popular grenadine brands, including some of the newer craft varieties. They’re pictured here from left to right. Visual: Light red, almost orange. Sonoma is the most expensive and is marketed as “Pomegranate Grenadine Simple Syrup” and you can tell. It’s the most subtle and mild flavor of all those we tasted, and it tastes the most like pomegranate. You may have to increase the amount of this syrup just to get the flavors right in your cocktails. Ingredients: Pomegranate, cane sugar, citric acid, orange flower water. This grenadine, like Sonoma, actually tastes like pomegranate. This syrup is sweeter than Sonoma, but natural ingredients lead to a different colored drink than some may expect, leaving Shirley Temples more copper-colored than red as a result. This one has good balance and isn’t overly sweet. “Corn sweetener” in this ingredient list is just another word for corn syrup. Comparing the ingredient list with Rose’s (below), it’s a very similar product at nearly triple the price. Fee Bros. definitely has a very familiar grenadine flavor, and it’s the most syrupy and sticky of this bunch. I like Monin’s syrup the best of these 5, because it’s a happy medium of the traditional (syrupy, red, sweet) and the craft grenadines (more fruity in flavor, less sweet, less red). Since the Monin bottle is so big (750 ml), the cost per ounce is very low. Ingredients: High fructose corn syrup, water, citric acid, sodium citrate, sodium benzoate, Red #40, natural and artificial flavors, Blue #1. Rose’s is the iconic brand of bar grenadine, and you’ll be able to find it in grocery stores nationally. As you can see, it has the dreaded high-fructose corn syrup in it as ingredient #1. There’s no pomegranate in it, it’s really just a sticky, syrupy red and features water as the only natural ingredient. Cost is the only advantage here – Rose’s tastes like snow cone flavoring.